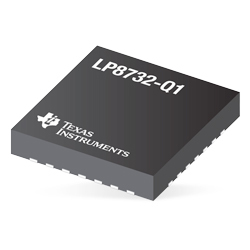 Texas Instruments LP8732xx-Q1/LP8733xx-Q1 Power Management ICs (PMICs) are designed to meet the power management requirements in automotive applications. Each device has two step-down DC-DC converters which can be configured as a single dual-phase regulator or as two single-phase regulators and two linear regulators and general-purpose digital-output signals. Each device is managed by an I2C-compatible serial interface and by an enable signal. The automatic PWM/PFM (AUTO mode) operation together with the automatic phase adding/shedding maximises high efficiency over a broad output current range. The devices support remote voltage sensing (differential in dual-phase configuration) to compensate IR drop between the regulator output and the POL. This increases the accuracy of the output voltage. The switching clock can also be forced to PWM mode and synchronised to an external clock to minimise the disturbances. The devices support programmable start-up and shutdown delays and sequences including GPO signals synchronised to the enable signal. During start-up and voltage change, the device controls the output slew rate to minimise output voltage overshoot and the in-rush current.